In this age of technology it is really important for our students to understand fundamental computing topics so I knew I had to review the new Digital Savvy course from CompuScholar, Inc. My teen has been using the information technology course, 'Digital Savvy' which we were given access to for the purposes of this review. CompuScholar, Inc formerly known as Homeschool Programming has a range of computer courses aimed at middle and high school aged students. 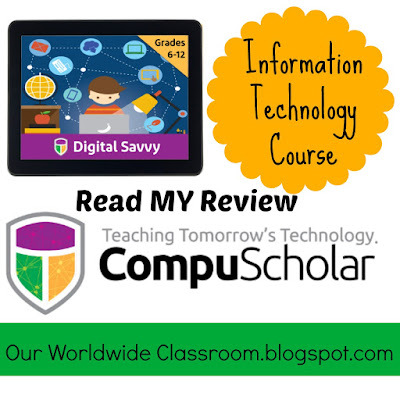 Digital Savvy is aimed at grades 6 - 12 and is an overall Information Technology course. It aims to teach the students about computers, various applications, it explores social media, has them creating simple web pages. This is exactly the sort of course I have been wanting my teen to undertake. A good overview of all things I.T and so far this course has been valuable to him. This has been one of the easiest to use programs we have come across in a very long time. It is so well laid out and navigation is a real breeze. As a user you really can't get anything wrong. After logging in to the program and selecting the Digital Savvy Course we were greeted with the screen below. There are a total of 25 Chapters in the course. Each chapter contains several lessons, a brief quiz at the end of each lesson. A culminating activity and chapter exam is also included. It really is as simple as log in and get started right where you left off the previous day. Below I have shared a series of screenshots showing the progression through the program. After logging into the Digital Savvy Course you are met with the chapters screen. Digital Savvy contains a total of 25 chapters. The lessons within each chapter are again very simple to navigate to. Each lesson contains a video and a quiz. All of the quizzes are graded. At the end of each chapter (approximately 3 - 5 lessons) is a culminating activity or project. These are submitted to the teacher (parent) for grading and the grades are stored along with each of the lesson quizzes. On completion of all the lessons and the activity for each chapter is a longer multiple choice test, which once again, this is graded. My son and have been chatting about this and there really isn't anything he doesn't like about the course. Some of it he already knows but that will be the case with many things he undertakes. Whilst he still is only in the early chapters the short lessons and ease of use really make this such a simple subject for him and a very hands off one for me. For me as the teacher/parent I love that this is completely graded. All of his scores are kept and he can see his grades for each test immediately. He also has the option of repeating the test if he wishes to try and improve his score. To use the program effectively we need nothing other than our computer and a decent internet connection. Every now and then a pen and paper and a word processing program is required but the bulk of the course is completed through the course itself. As a busy mum with younger kids in the house that need my attention having the teen able to work independently, even on new to us courses, is such a blessing. Without a doubt we will continue working our way through this course to completion and I am very confident that I will have my other children take the Digital Savvy Course also as it is great computer science basics course. If you would like to read other reviews about the various courses offered simply click on the image below. We recently experienced one of the worst natural disasters our local area has seen in a very long time. I personally have no memory of anything ever hitting our area as hard as this. In less than 30 hours our area had 890 mm of rain dropped on us. No wonder it had nowhere to go. We though, are the lucky ones and whilst being placed on a possible evacuation list was mightily scary our only real threat was that of surrounding roads being cut off. And cut off they were and still are. The above three images are from a road that we use almost daily. The sheer force of the water is simply unimaginable. This is a major bridge and thoroughfare for our area and we cross this bridge at least once a week. It is an area of the river that floods regularly, but that happens way down below the bridge, across the old original bridge that is much closer to the actual river flow height. This newer bridge is several metres higher than the flow of the river and has received extensive structural damage. For water to bend a light pole is simply mind blowing. The kids could not believe their eyes and this was absolutely hands down the best way to show them the reasons why they never ever enter flood water or try to cross a bridge that is covered with flood water. We simply have no idea what is under that water and whether the bridge is even actually still there, as happened a few kilometers from us. So whilst we certainly didn't want to experience a natural distaster on this scale and my heart breaks for everyone that has been so severely affected by this, it truly is education at it's best. Eyes glued to the weather radar, watching the cyclone, tracking it's moves, discussing the eye and then watching how it breaks up as it heads south. Then sitting through the torrential rain, only to wake and see the worst flooding we've seen right across the road from us. Nature's fury right there in all its glory. The vast majority of the time flooding creates nothing but havoc and devastation but every so often it creates a beautiful scene and the stillness of what appeared to simply be a lake was quite beautiful, except that it was covering a road, had entered several houses in this area and took lives, both animal and human.